Description: From 2 to 3 tall tall. Leaves are ovatelanceolate, sharply serrate and measure 3 to 6 inches long. The upper leaves and stem are often tinged with bronze or dark red. Flowers are scarlet red in color with exserted stamens, flowers are 1.5 inches or more in length, multiple flower to a head. 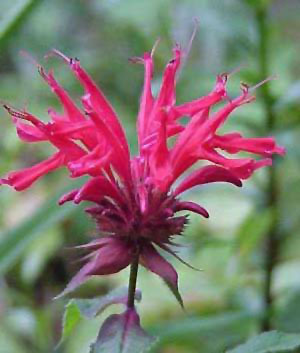 It is native to the eastern part of USA but is frequently raised as an ornamental under the name "Bee Balm".